Christina - Why Ellis Island Gives Her Strength to Succeed! Christina - Growing up Italian. Rich in tradition-Big Holiday Celebrations always a reason for getting together and most of all, the love for good food and a recipe for life can be taken from Ellis Island. Pride, respect and a strong determination to succeed were foremost when growing up Italian in the United States of America. Chris's grandparents, born in Italy, came to America through Ellis Island. Christina and her husband traveled to Ellis Island where we were able to identify the ships my grandparents and other Europeans were aboard. They read the manifests, the names and dates of arrival. Her grandparents came to America, bringing the dream of a better life. Their success in America never hinged on their ethic background, just by having the greatest opportunity the country offered at their time. They held onto their rich Italian heritage and never forced it on anyone. Growing up Italian, Christina found herself anxious to hear their stories, their traditions even though she lived them daily. They spoke very proudly of their heritage, yet they loved being in America and having the opportunities that America afforded all people. Both her grandfathers started and grew very successful businesses. One was in landscaping and the other in construction. Her grandparents worked hard. They provided for their families and embraced any chance they had to help newcomers to become successful. Once you were invited to their house to “break bread” you were a friend for life, and, they loved to eat! Chris's grandmother’s family owned and operated a boarding house, which her great grandmother ran. Grandmother cooked for 8 to 20 people at a time. All the meals were made from scratch and all vegetables were grown in a garden. As Christina grew older, she was not only intrigued with the dishes her grandmother made, but how she put them together. Christina would spend hours in the kitchen with Gram… watching and learning how she cooked while learning to cook. Chris's passion for cooking became strong. Fast forward to the early seventies when Chris married and started a family. Her cooking confidence was not as focused as it is today. John, husband, a dual career Citizen soldier, charmed that she could cook, was rarely home for him to eat a sit-down meal so he would eat out then go to his avocation. Christina became creative and began cooking on weekends, meals that they could eat and he could quickly prepare when he had to leave for his second career. He loved the idea of her preparing meals to eat during the week, but more than that, he loved her cooking! For these reasons, they decided to put together a basic cookbook titled “Recipes from Louise” straight from the recipe card box Chris's grandmother so cherished. The recipes have been taste tested for many years. Some they ate regularly, others were prepared for special occasions or everyday delicious meals that tasted even better reheated. In the modern era of prepared foods, Chris learned to use the same basic recipe Gram used, but modified them to fit their busy lifestyle. John, even working dual careers started his own business. Chris was working two part-time jobs and was a home-maker. This truly was not growing up Italian nor was it something Chris's mother had to do when raising her kids. Slowly Christina 's world turned into full-time work when her daughter started school. She still prepared lunches, cooked dinners, cleaned house as well as practiced making pasta recipes which included lasagna, meatballs, fettuccine noodles and homemade sauce. It was a fast twenty-five years, and just about every weekend they had friends over for either Saturday or Sunday dinner. It was a lot of work, but Christina would not have had it any other way. It gave her great satisfaction being able to put a great meal that rarely had any leftovers. After learning her father was diagnosed with cancer and her mother’s fear that she might be alone, Chris and John, after great deliberation, decided to give back to parents that had been so giving to them and all Chris's siblings. Chris and John were empty nesters. They sold their home and relocated. Within a couple of years, they purchased Chris's parents home. Becoming caregivers, new jobs, new state, the transition from empty nesters to caregivers and huge mortgage, it became even more important to coordinate their time between all the responsibilities. The transition was a huge responsibility and their lives changed. But their strong commitment and sense of respect for each other kept them together to do the right thing. However when Christina thought of all those who passed through Ellis Island she became truly grateful for all she had. Chris's mother suddenly passed away. Her father was devastated. Her mother, in the tradition of the Old Italian marriage, doted over her husband; he was the king of the household. Christina pulled every source of inner strength. Not only had she lost her mother, she also was now worried about her father, a man who had just lost his wife of 56 years. He was now "on his own" but not living alone. "One day at a time" was Chris's mantra and was the only way she could emotionally handle things. Since the loss of her mother, Chris's passion for cooking fast became a creative outlet. Chris cooked almost every night of the week, and when she did not cook, they were having home cooked leftovers. On weekends, she was able to spend time in the kitchen, creating and modifying the recipes that everyone enjoyed through the years, and yes, making mini-meals for her Dad and John. Her father who has since passed, was still able to say “it tastes just like your mother made.” That was the only compliment Chris really enjoyed from her father. John was always supportive as he did the cleanup with her father. He also drove a hundred miles a day and maintained the web site, still not forgetting my grandmother and my mother. Their daughter is married and appears to be a career woman as a member of the Military. 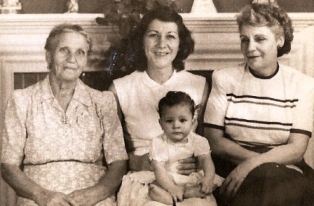 She loved her grandfather and grandmother and the stories she heard about growing up Italian. Stationed in the USA, she and her family knows where they can come and get a great meal that her great grandmother and grandmother inspired, even though they would have to drive a long distance. It is Chris and John's hope her next station will be even closer, however as they know very well, as a member of the United States Military, you serve at the discretion of the Commander-In-Chief and go where you are needed. As you try the recipes from their original Recipes From Louise cookbook, know they have been created from the heart and have been in their family over eighty years of growing up Italian. When you try recipes from contributing homemakers and cooks, know that they gave them a try too so they could give back to those who helped them keep this web site exciting. And remember, growing up Italian nor coming through Ellis Island is not a prerequisite for being a great cook. In addition, you don't have to be a trained chef to prepare a great tasting meal for your family. You just have to have a little passion and heart. And if your desire is to give back to others but don't know how, let your passion be your guide and allow them to show you how passion is giving back while paying it forward. Update.... Today my husband and I are the elders. Our desire is to insure our family knows how important it is to be an American family that embraces each other and the freedom that America provides. It is important that in America we be Americans and embrace the Constitution that that made this country great. Please, do not succumb to the lure of Marxism the Democrats are trying so hard achieve by using misinformation in our schools teaching our children that the government is the answer to family. Learn more about Growing Up Italian. Learn more about what makes me tick.